My excitement rose when I first glimpsed the Wildlife Way Station being maintained at the car rest area along I-95 in Dale City. A good-sized plot of land was being cultivated with native plants that were attracting and feeding many of the area’s wild birds and insects — pollinators. Those small flyers have been losing ground for many decades as loggers cleared large swaths of fields and forest to make way for human housing developments. More and more, it is up to us to ensure that these wildlife havens continue to exist. 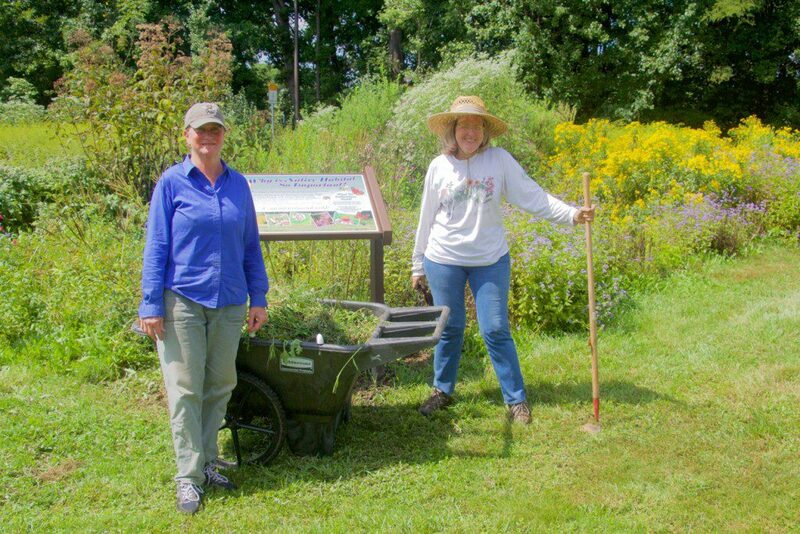 The Virginia Native Plant Society was called on early in the process to help plan and install this garden, which was mainly funded by the Virginia Department of Transportation: part of a goal to establish numerous similar projects around the state. Our VNPS President, Nancy Vehrs, not only helped with the initial stages, but also now leads the considerable efforts at ongoing maintenance that planting such as this one require. Volunteers at the site had been working on a successful transition from lawn to Way Station for about two years when I, a new recruit, first came to it in the summer of 2017. It was early in the morning when I arrived, and already five volunteers were at work, pulling out the interloping weeds and breaking up the sod to receive new native plantings. 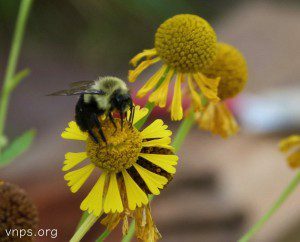 It was mid-summer, and everything was alive with pollinators — it was all I could do to leave my camera in its bag, and put on my weeding gloves. On this June day, the flowers were abuzz with butterflies and bees — just the kind of place I love best to do my nature photography. But the photography could wait, the bees would still be there at the end of my shift; it would be the reward after a few hours of weeding. 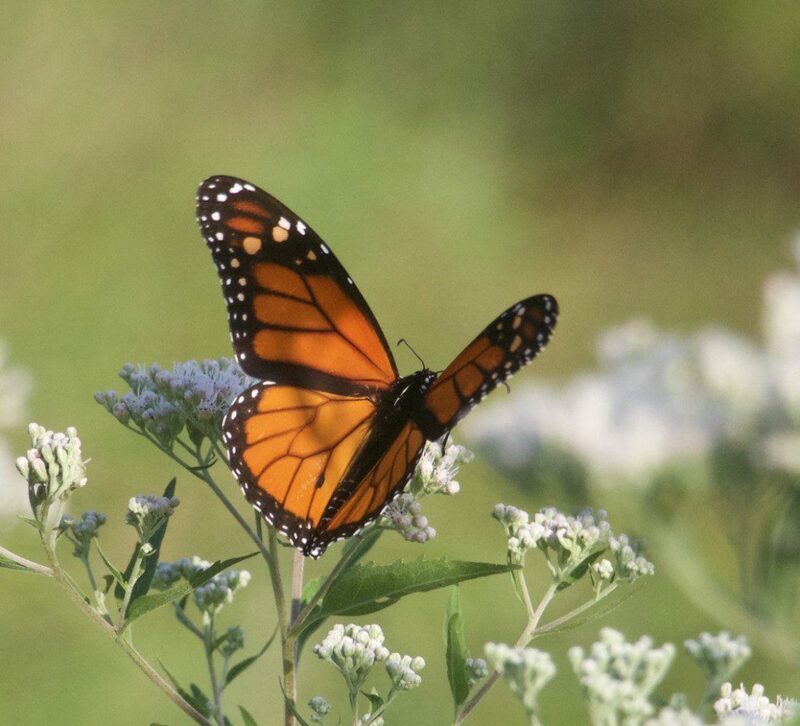 We picked our work areas, and dug in, knowing that this plot of land was serving as a life-saving oasis for the area’s wildlife — those creatures whom area naturalist Alonso Abugattas identifies when he speaks of “Nature’s Puzzle”. I know that we are all part of that puzzle, whether mammal, bird, insect, tree, plant or fungus. We are interdependent, we and they. The loss of one part of the puzzle can spell the end of others; the simple fact is that we would not survive long without pollinators. Native bumblebee on Sneezeweed, (Helenium autumnale), one of the 8,000 plants installed in September 2015. 1,000 more were added this August. At last we quit, and as the sun rose in the sky, we sat at the nearby picnic bench, to slake our thirst and sample the treats that our fearless leader, Nancy Vehrs, had brought for us. The workout had been good, our exercise for the day complete, and as we rested, we tried to identify the various species of butterflies nectaring on the flowers. I can’t wait to see the newly planted seedlings as they begin to emerge next spring. As every gardener knows, it is something to look forward to. Nancy tells us that by as early as April of next year we may be able to begin another season as the plants start to put out new growth. My work done, I reached for my camera and spent many minutes observing and capturing the pollinators close up as they foraged for pollen. These are my moments of bliss, found at a rest area Way Station along an Interstate highway crowded with city-bound commuters. We could use a few more hands, and I hope to make some new friends who feel as passionately as I do about our local wild scene. I’ll look forward to seeing you! Brigitte, eloquent and beautifully photographed as always. I retire in January, so consider me your first recruit for spring clean up at the I95 rest area. Valerie, thank you for your comment!! We will put you ‘on call’! Oh, good! We’ll have fun together, Valerie! We look forward to that, Valerie! Come one, come all!